Actually, my pastor was right. Never pray for patience, because when you do, God is more than happy to put you in situations where you need patience. Ever since Lee and I moved here to the Dominican Republic, I think I’ve prayed for patience on a daily basis. I know what you’re thinking, but you should know that living in the D.R. and being put in situations where you need patience are redundant. So when I am in a jam where my head is about to explode, I think of two things. The first is another thing I learned at Relevant: Be the church. It’s a mantra that reminds me that regardless of the situation, I am called to be a reflection of God’s grace and love. ::whispering:: Be the church. Be the church. Be the church. The second thing I think of is the chorus of perhaps my favorite Guns N’ Roses song called Patience. Although the song is about a relationship between a man and a woman, the lyrics of the chorus are applicable in any stressful, p.i.t.a. situation. Today we completed some back to school shopping for some of the kids, and the scene inside the store we visited can be best described as chaotic. For reasons I can’t really explain (yet I understand because I grew up in Miami), the people here seem to be very impatient. Don’t get me wrong; Dominicans are sweet and friendly and inviting and generous, but they are absolutely not zen-like. Just spend a minute driving on the roads and you’ll understand. So when there are nine people in line and there is only one person at the cash register, the vocal opinions start flying. Comments about how there should be other registers open abounded. People began looking to cut in line because they only had one item to buy. The atmosphere grew toxic quickly. It’s important to note the store was not air-conditioned, the outside temperature was about 90 degrees, and it had just finished raining, so humidity was at a million percent. It was hot, sticky, crowded, noisy, the lady behind me was jabbing my ribs with her shopping basket, and there was a man in the corner that kept looking at me funny. In looking at the lady working the register, you can see her counting the minutes in her head until closing time. She was being berated by customers, sometimes verbally, almost always visually. I stepped up to pay for my items, Axl Rose’s whistling still playing in my head. I said hello and I wished her a good day. Startled, she looked up from her register as if in shock anyone would offer her a gesture of kindness. I smiled at her and she smiled back, I think more out of instinct than out of genuine reciprocation. We completed the transaction and I thanked her for her help. She looked at me and thanked me with her eyes. It was only a split second, but I can see it was a moment of relief she was able to experience before diving once again head first into the hornet’s nest. Now I know this post smacks of humble-brag, but what I want to share is this: goodness begets goodness. In this particular case, patience begat kindness. For me, it became apparent all my prayers for patience were not for my benefit but rather for the benefit of others. All my hours in the proverbial furnace were not so I could appreciate the splendor of the refinement. They were so the woman at the register could have a tiny moment of joy in an otherwise joyless situation. God does not work on us for our sake alone. God works on us for the betterment of His kingdom. And the thought of being an instrument for His glory is music to my ears. It was a strange and almost surreal experience, standing up in front of the congregation while my Pastor spoke loving, kind, and supportive words about me and the faith journey I am on. It was all part of the process of being ordained through my church and carrying with me the fully certified and recognized authority that comes with the title. My new faith journey began in June of 2009 when my wife and I attended Relevant Church for the first time. Since then, Lee and I plugged into service ministry, small groups, volunteer efforts, and mission trips. I feel our spirituality has grown exponentially since we discovered: faith is about a relationship and not religion, faith is meant to be done in community, and that through our individual faith in God we are stronger together as a couple. So as Pastor Paul completed the presentation of the certificate of ordination, I felt Lee’s name deserved to be on that certificate as much as mine. I would not be the man of Christ I am today if not for her guidance, direction, and support. I would not be on the cusp of moving to the Dominican Republic if not for her shared enthusiasm and determination to do God’s work. I may have attended the classes at Trinity College of Florida, but Lee was with me every step of the way. It is an honor and a blessing to be able to celebrate this milestone in my life, and I owe a world of thanks to everyone who also helped make it possible along the way. I feel I am a reflection of the collective love and support I’ve received from my friends and family, and I hope I will continue to be a positive representative of this loving community in the years to come. On a completely separate tangent, I sent a photo of me to our Technical Director Jarrett asking him if it could be included in the service. It was a picture from my First Communion, and no, it did not end up as part of the service. Although Jarrett wanted to use the pic, Pastor Paul was not on the same page. Those in attendance at Relevant may have been deprived of this glorious artistry, but you won’t be. So please, enjoy! Upon looking into the meaning of the pins, I learned many of the celebrities arriving at the awards show wore black as a statement of solidarity with victims of sexual misconduct. I can’t begin to understand what a victim of sexual misconduct feels with regards to dealing with a traumatic memory of unwanted advances and opportunities foregone as a result of saying no to a predator. Yet I can assume the current climate of greater openness and increased dialogue of the subject matter is one that is a welcomed by those who’ve lived so long in silence. It takes a certain amount of courage to come out and stand up against a predator, especially one who has the weight and power of a Harvey Weinstein or other lofty executive. We fear to stand alone in our pain, being looked on and judged, wondering if the risk of speaking out will result in the reward of justice. To see so many artists come together in solidarity is heartwarming and much needed. These conversations that begin in Hollywood will hopefully traverse the walls of boardrooms, private offices, and even personal bedrooms across the country. My pastor today preached about drawing courage by worshiping God. “Worship is being God-conscious and not self-conscious,” he said. When we’re right in our worship of and alignment with God, we can stand confidently in what we say and do. This means defending and advocating for those who are not in a position to help themselves. There is a lot of darkness in the world, and it is our job as believers – as followers of Christ – to shine a light into every corner of our planet. Silence equals darkness, and we should not be afraid to speak up for those who cannot. We should also be willing to stand next to those who use their voice against any form of oppression and victimization. We are the defenders of His truth and the carriers of His light. Let’s make sure His light shines on. I’ve been in the corporate world since I graduated from college in 1994. In those 20+ years I’ve seen and worked with a wide variety of bosses, managers, and leaders. If I’ve learned one thing, it’s that the person who is an effective manager and also a natural leader is the exception to the norm. More rare than that are the servant leaders, those who are in positions of leadership and authority who also have no problem rolling up their sleeves and getting dirty with the people she or he leads. Today I am thankful for the Paul Wirth, the pastor of Relevant Church. Paul is a servant leader. Paul is not only willing, he is eager to get in and ‘do’ with the other members of the congregation. Paul leads by example. Paul is MY pastor. I had an assignment for school regarding evangelism and discipleship, and how much of the annual budget is designated for such programs. Paul was willing to meet me this evening to discuss the assignment. We met at a Starbucks – Paul and I share an affinity for lattes – and after initial chit chat and mutual coffee sipping, we tackled the assignment. I thought the discussion would be mostly in the realm of finances, with me perusing spreadsheets and other planning documents used by Relevant. Instead, Paul took a deep breath and proceeded to explain. “Everything a church does has something to do with evangelism and discipleship, because that is why the church exists,” he said. He went on to further outline how every ministry within Relevant is aligned with evangelism and discipleship in some shape, way, or form. Everything Relevant Church does has to do with sharing the Gospel and having people take their next steps in relationship with Christ. Having been a member of Relevant since 2009, I can attest how true his words are. Relevant, in all it does, is aligned with Paul’s vision of teaching every person to love Christ with all their heart, mind, soul, and strength. Not only am I thankful for Paul and his willingness to take time out of his day to meet with me, I am so grateful for being able to be a part of Relevant Church. Relevant is my spiritual home, and the people with whom I get to share my Jesus journey are my family. It truly is a blessing to do life with them. I like to think I have a pretty high tolerance for pain, but I am by no means one of those adrenaline junkies that get a thrill from enduring grueling and painful conditions. For the most part, I embrace my lazy side and you can usually find me on the corner of comfy and cozy. So it took focused determination to pull the trigger on an idea I’ve had brewing in my mind for …. well years. My wife and I are planning to transition to full time mission work in the 2019 – 2020 time frame. We’ve participated in several short-term missions with our church, and our hearts are in dedicating ourselves to serving God with all we have. One of our favorite memories is being in the Dominican Republic with our pastor who has the story of King David tattooed on both his arms. Who knew permanent ink on skin could be a tool to evangelize the word of God? As we prepare for our third visit to the D.R. in January, I wanted to take a page from my pastor’s playbook and wear my faith on my sleeve as well. So tonight, while basically all of America was watching Game 7 of the World Series, I was sitting in a chair at my friend’s tattoo shop getting my first (and second) ever tattoos. I’ll admit, brave perhaps is not the most appropriate word to describe my decision, but it’s not something into which I entered lightly. There was the uncertainty of how painful actually getting a tattoo would be. There was the concern of how they would come out. There was a touch of anxiety at the thought of eventually showing them to my mom. There were a lot of hurdles, mostly mental, I had to clear to bite the bullet and get inked. …but in the end, I remembered that fear is not from God, and after all He’s done for me, wearing my faith for everyone to see and using the talents of my friend and tattoo artist Shawn to help share Christ with others is the least I can do for Him. I guess if I really think about it, there was nothing to be scared about at all. Coincidence is just God showing off. And it was by coincidence about a month ago my wife stumbled across an announcement the venerable and talented Kevin Smith would be conducting one of his famous Q&A sessions at Tampa’s Improv comedy club. In the early stages of our relationship in 2005, Lee and I bonded, in part, because of our mutual love of Kevin Smith and the movies he makes. “There is no way we’re missing this,” she told me. “Umm …. I may be in New York on August 12 playing telephone repair man,” I reminded her. “There’s no way I’m missing this,” she said with a confident, unapologetic smile. And so this evening my wife and I had our second ‘go out on a school night’ date of the week, and it was amazing. Kevin Smith is a fantastic story teller. If you let him, he could tell stories for days on end. Tonight’s performance was, by definition, a question and answer forum with the acclaimed writer and director. One would think Smith would cover a wide array of topics and subject matter. He did, but in the two hours allocated, he answered only four questions. That’s how detailed and immersed Kevin gets into telling a story about how or why he did something a certain way. And through it all – through the foul language and inappropriate subject matter, through the stories of friends maintaining sobriety and fighting off thoughts of suicide, through eye-opening accounts that show the human and real side of celebrities often thought to be divas – the common theme was inspiration. It was a slap in the face to me, but one I desperately needed. In my new-found faith journey, one I’ve been traveling for just over six years now, I’ve immersed myself in the writings and teachings of so many men and women of faith. Steven Furtick, Christine Caine, Joel Olsteen, John Eldridge, Joyce Meyer, Craig Groeschel, and, of course, my own pastor Paul Wirth: I’ve learned so much about God and my faith and my relationship with Jesus all because of their words, teachings, and actions. I am currently reading Circle Maker by Mark Batterson, and it’s not hyperbole when I say the book is transforming my life. Not only am I learning about the power of prayer, I am experiencing it as well. I remember listening to the audio book four weeks ago – yes, I am a slow reader/listener and I don’t do a good job making time to finish the book – and being inspired to pick up a writing project I shelved a year ago. It’s an intimidating project I’ve been avoiding, and I always manage to find a reason to not start it up again. Yet there I was in my car, crying, and feeling Batterson’s words speak to me. I still haven’t touched the project. God has enveloped me in kid-glove-like affection and direction by surrounding me with such inspiring and positive works, yet I still find myself in the rut of my own making. I still find myself playing it safe in my comfort zone and ignoring what He’s calling me to do. And that is why I think God took a different approach with me tonight, one filled with F-bombs and stories of smoking weed on hotel room balconies. There’s no doubt in my mind God put me in the audience of Kevin Smith’s show so I could finally do my part and get back to the keyboard. It worked. Today is August 12 and I hadn’t posted to my blog since July 2. The writing hiatus stops now. God does His part to give us joy, accomplishment, and greatness. He delivers every day in a million different ways, yet we fail to listen. We fail to move. We fail to act. We fail to respond. As is the recurring theme in scripture, we fail God while He remains faithful to us. During the Kevin Smith show, we were not allowed to have our phones out at all. This is very understandable, but hinders my affection for tweeting great quotes or ideas as they are said. Thankfully, I was able to capture some of them the old-fashioned, analog way: pen and napkin. Here are some of the tweet-worthy comments from tonight’s show. In His own crafty way, that’s what God told me tonight. I’ve been watching other people on the ice for so long. Now it’s my turn to lace ’em up, get out there, and skate. Today we were in another sugar cane village. What set this one apart was that it had a park area, complete with a basketball court. 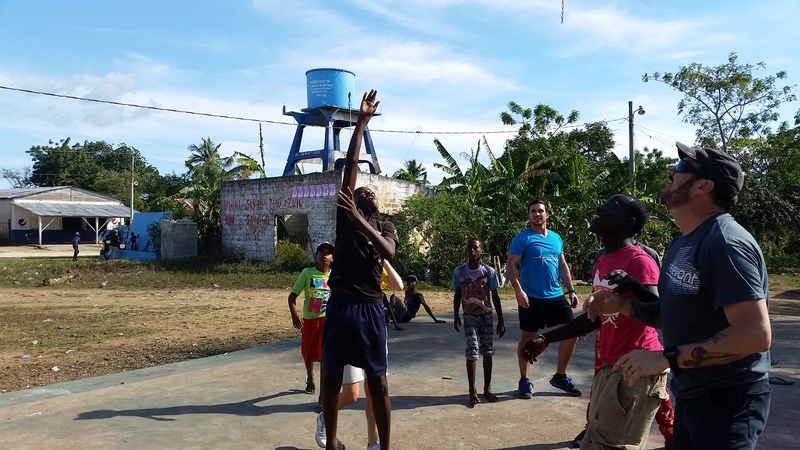 Almost immediately we broke out into a game of 4 on 4 half-court with the kids from the village. I learned two things today: 1) Playing basketball in a leather fedora is never a good idea, and 2) My pastor has no problem rejecting a layup from a girl who measures five foot nothing. The basketball and the crafts and the finger nail painting and the many other activities we shared with the girls and boys of the village was our way of bring an interlude of joy and happiness into the lives of children who have next to nothing in their day to day. In an existence where running water is a luxury, babies meander in the road with no clothes, and girls are cast off as second class citizens, it was fulfilling to be able to deliver smiles and a certain sense of wonderment to those children. Still, our mission was quite clear; to do our part to ensure eternity for those little souls. And it starts with sharing the good news of Jesus Christ. It starts with literally reaching out to each and every child and inviting them to the house of God to hear someone’s testimony. It involves taking the time to share our stories and evangelize to others the grace God has displayed in our lives. Feed them the Word and they will be nourished. Nourish their souls, and they will be saved. It doesn’t take one time. It doesn’t take two times. It may take the fifth or tenth or fiftieth time for someone to finally hear God calling them and accept Jesus as their Lord and savior. It’s not enough for us to visit that village once, gift them with food, candy, and playtime, and expect them to all become Christ followers. It takes our team, and the team after us, and the team after that. It takes weeks, months, years of ministry. It takes a commitment from the church, the collection of Christians worldwide, to invest time, money, and love to bring the gospel to those who need it. And although these people with whom we interacted and shared today have a laundry list of physical needs, there is nothing they need more than Christ. The analogy I use with my kids is imagine being invited to a party. Not just any party, but the most amazing, fun, insanely awesome party in the history of ever. Now imagine that the people you love and enjoy being with won’t be at the party with you. They have a chance to go, but they either don’t know about the party or simply have no interest in going. Wouldn’t you go to great lengths to tell them about the party? Wouldn’t you do everything you could to convince them to go? To me, that’s what heaven is. An eternity of joy in paradise, a salvation not because of anything I did (Ephesians 2:9), but rather because I believe, acknowledge, and declare that Jesus died on the cross for me and is my Lord and savior. It’s a never ending task because there is always one more person to reach and one more soul to lead towards salvation. And as I learned on this trip, it’s not my job to save souls. That is God’s duty. 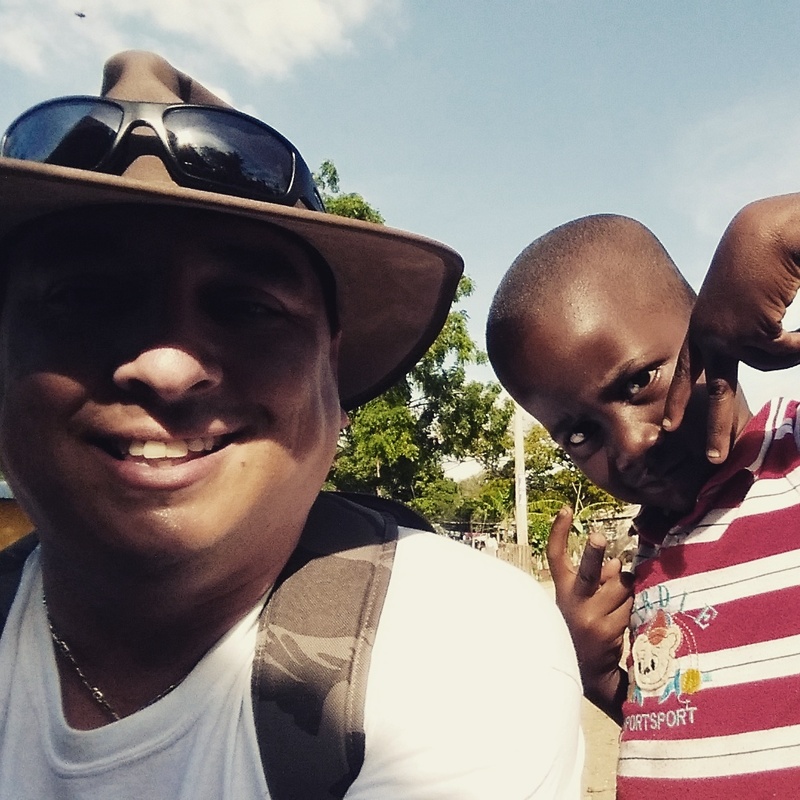 My job, as a follower of Christ, is to play my part in introducing others to the beauty of Jesus Christ, be it here in the Dominican Republic, back home in Tampa, or wherever it is I find myself. And that is something I can do no problem.